The development of a system of internal control over public finances by its alignment with internationally recognised standards and methods, and with the best European practices, is a commitment established by the Association Agreement between Ukraine and the EU. The strategy for reforming the public finance management system in Ukraine for 2017-2021 identified the need to improve the level of managerial accountability and effectiveness of internal control and audit in central and local government at the central and local levels. It brings relevance to clear definition of the powers of financial control bodies in respect of local budgets, the need to revise control powers of local financial bodies, including AHs, need for the distribution of powers between the control, audit and supervision authorities in Ukraine, exchange of professional knowledge in solving urgent issues of AHs in terms of audit and control. That is why the U-LEAD with Europe Programme organised a three-day training “Control, audit and supervision over financial resources of local self-government bodies”, attended by municipal financial advisers of Local Government Development Centres, international experts, specialists of the Ministry of Finance Ukraine, Accounting Chamber of Ukraine, State Audit Service, Central Reform Office under MinRegion, Kyiv City State Administration, experts of international projects. The training is aimed at familiarising participants with control, audit and supervision functions, identifying the fundamental difference between internal and external control and audit, familiarising with the experience of Germany and the Balkan countries in this area. The training programme aims at raising awareness of the participants about the current state of state control and audit of local budgets, on the powers of the State Audit Office of Ukraine, Accounting Chamber of Ukraine, and the policy of the Ministry of Finance of Ukraine in the implementation of state control and audit in Ukraine. The training participants got acquainted with legislative innovations, realities and prospects for implementing financial and budgetary control and audit at the local level. The opening ceremony was attended by Timo Biank, Team Leader of U-LEAD with Europe Programme, Oleksandr Svystun, Managing Director of LGDC, and Simone Neumayer, expert on PFM, U-LEAD with Europe Programme. Mrs Manuela Soller-Winkler, Former State Secretary of the Ministry of Interior of the Land Schleswig-Holstein, told the audience about supervision over local finances in the context of the European Charter of Local Self-Government. Jasmina Djikic, expert at SKL International, spoke about the features of the organisation of state internal financial control system in Bosnia and Herzegovina. The participants of the training worked out practical examples that allowed to better understand the essence of these concepts. A key idea of ​​a really effective internal control is that the budget manager should be responsible for the effectiveness of using budget funds not before the higher authorities, but before their voters, hromada residents. Andriy Maysner, Deputy Head of the Accounting Chamber of Ukraine, Igor Stefanyuk, Deputy Director of the Department for the Use of State Budget Funds in the Regions, and Oksana Chorna, Deputy Head of the Accounting Chamber of Ukraine, spoke about the state external financial control (audit) of local self-government bodies. The participants of the training had the opportunity to discuss external audit peculiarities and its practical significance for the state. Besides, Accounting Chamber representatives presented audit plans in 2019, including the AH budgets. Tetiana Borovkova, Head of the Department for Development of State Financial Audit, European Integration and Control over the use of EU funds by the State Audit Service of Ukraine, told about the urgency and role of the state financial control of local budgets in the process of the decentralisation reform. Together with Halyna Vasheka, Deputy Head of the State Audit Office of Ukraine, and Tetyana Marchuk, Director of the Department of Control of the Authorities, Defense, Law Enforcement and Local Budgets, training participants discussed the powers of the State Audit Service on control over local budgets and considered the practical aspects of their implementation. The basic components of state internal control and its modern development in Ukraine were presented by Anna Kavichenkova, Deputy Director of the Department for the Harmonization of State Internal Financial Control of the Ministry of Finance of Ukraine, and the issue of internal control in the government was discussed during a speech by Vyacheslav Naboka, Head of the Internal Control Harmonisation Division of the Department for the Harmonisation of State Internal Financial Control, Ministry of Finance of Ukraine. Olena Chechulina and Olga Bezrukava, financial control and audit experts from LOGICA project, presented international commitments of Ukraine and conclusions of international financial organisations and experts on the current state of affairs in the field of state control and local budget audit. The legal and regulatory framework for state control and audit in terms of exercising powers by the state financial control bodies and mechanisms for their provision at the local budget level was elaborated in detail. The speeches were accompanied by an active discussion of problematic issues and ways to resolve them. Speech by Oksana Koltyk, Director of the Department of Internal Financial Control and Audit of the KCSA, aroused particular interest among the participants. Mrs Koltyk spoke about control and audit system organisation in the Kyiv city state administration. Yanina Kazyuk, fiscal decentralisation coordinator, CRO, and Viktor Ventzel, expert of the Fiscal Monitoring Group, CRO, emphasised control and audit peculiarities in the budget process, as well as key innovations of tax and budget legislation with regard to local budgets. 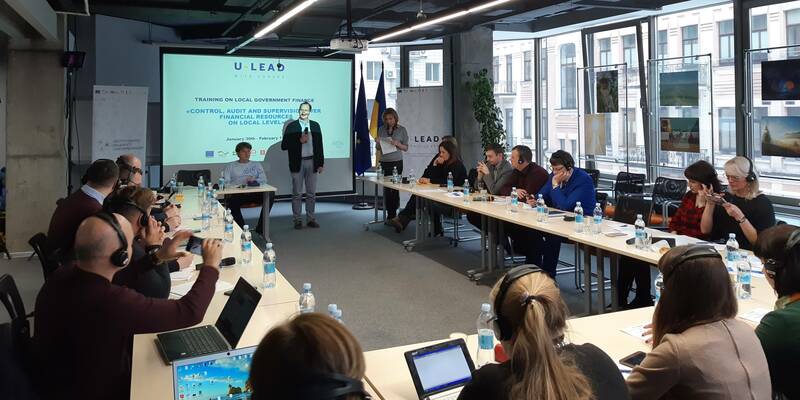 The event was organised within the framework of U-LEAD with Europe: Ukraine – Local Empowerment, Accountability and Development Programme.